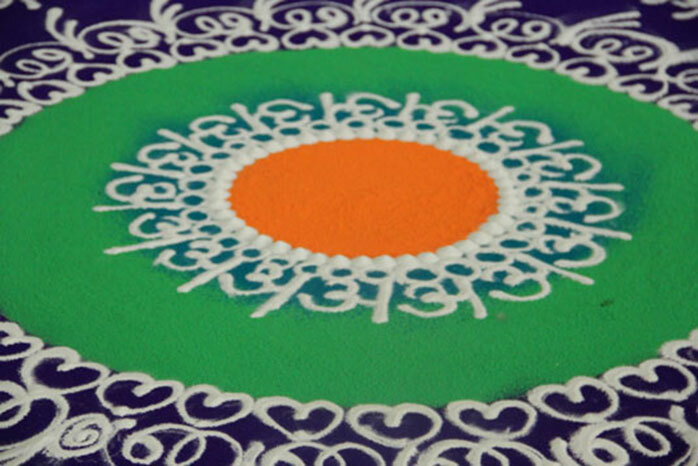 Rangoli is very much an ‘art of the moment’, much like sand sculptures or street paintings. Its transient nature means it is dynamic, much like life, and culture. 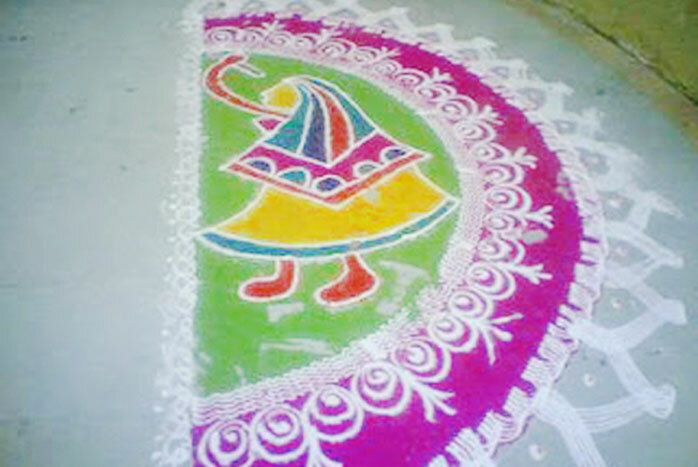 Generally, traditional rangoli designs tend to be geometric and proportioned, though this has changed over time and newer themes and variations are being explored. 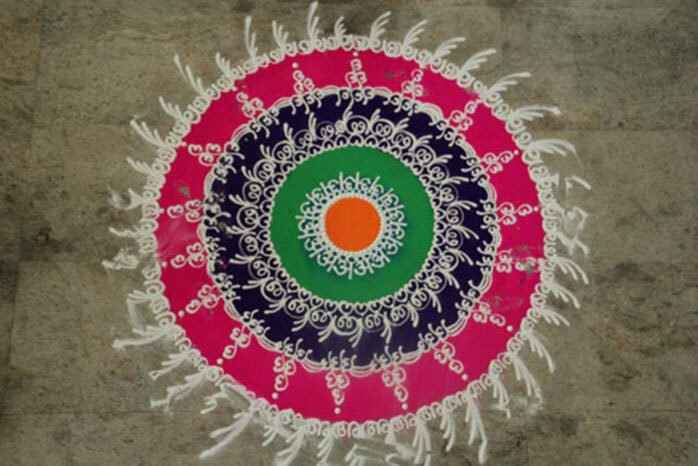 Rangolis can be of any size, from the size of a doormat, to the size of an entire room. 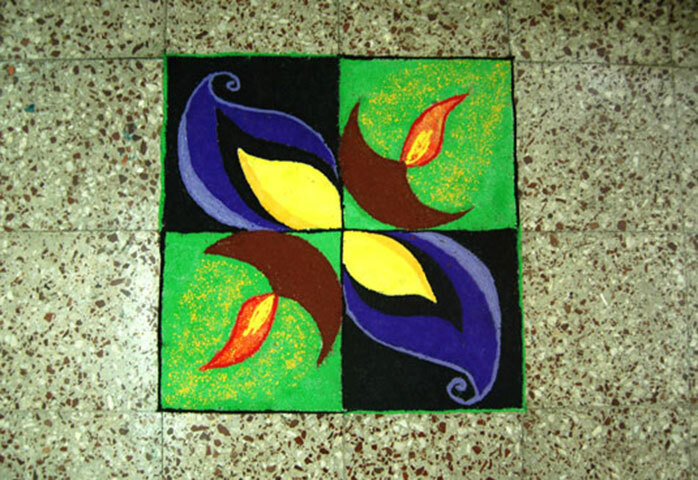 Rangoli was originally done in small patterns like, 2 feet square. Nowadays, entrance to homes, wedding halls, large areas of floor in hotel foyers, are covered in intricate and detailed rangoli designs. 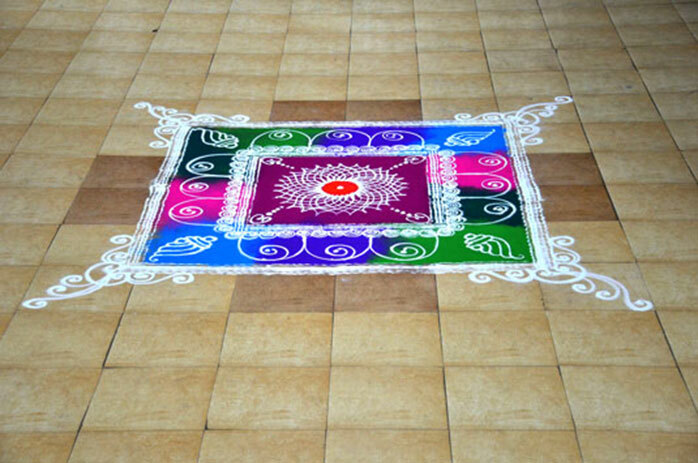 Traditionally, such floor decorations were done only on auspicious occasions or festivals. But today, they grace many occasions such as - weddings, birthday parties, opening ceremonies, corporate functions etc. 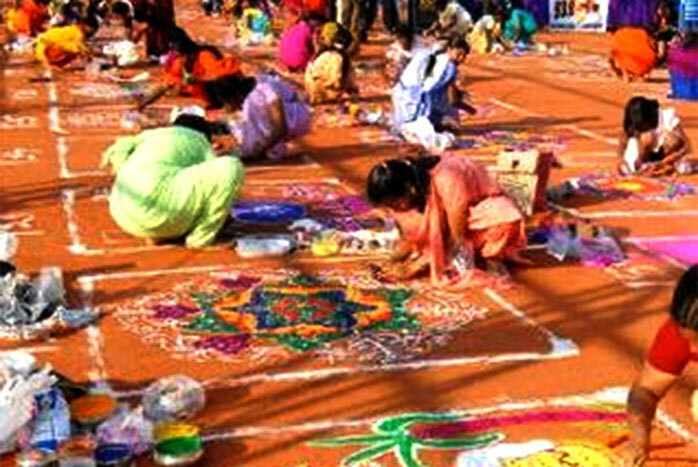 The one important point that all rangoli artists follow implicitly is to see that the entire pattern is created by an unbroken line, with no gaps to be left anywhere so there is no opening for evil spirits to enter. This is a strong belief in the Indian culture. 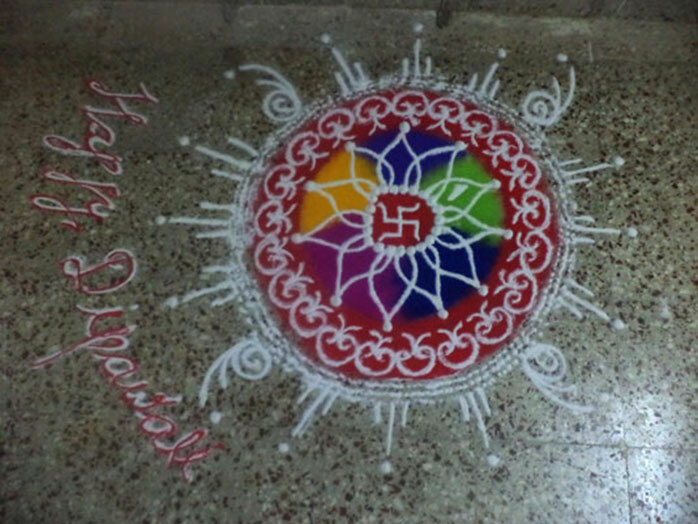 This is important as rangolis are mostly drawn as an auspicious expression of hospitality to invite Gods/Goddesses and also guests to bless one’s home. Women have traditionally been creating the rangoli patterns from memory while watching their mothers and grandmothers draw them all their lives. Girls on their way home from school would look at neighbour’s patterns and attempt to reproduce them when they got home. These days, girls copy from rangoli pattern books available from Indian publishing companies such as Navneet, or from weekly magazines and websites that feature “new” rangoli patterns, non-traditional patterns, some even include depictions of Santa Claus. The materials that are used to make a rangoli are easily found everywhere – therefore there is no income divide –it is found at homes rich and poor. 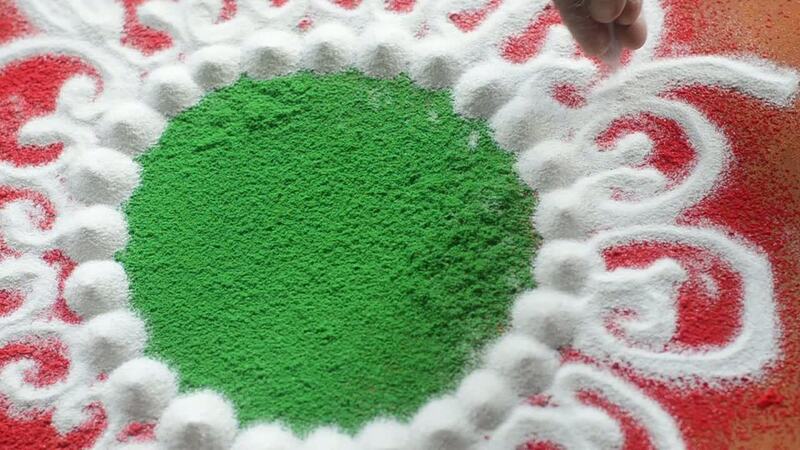 A variety of ingredients are used to create a Rangoli. The day to day rangolis - the line drawings, in geometric and symmetrical shapes are drawn with dry rice powder or with rice paste. Rice powder is used because it is white in colour and readily available. Also, it serves to feed ants/insects and small birds. This shows that one must take care of other forms of life too, to create a natural balance. The dry, coarsely ground rice powder is placed between the thumb and forefinger and rubbed together and moved along a predetermined design by the artist. On festive occasions, large designs, depicting the occasion are drawn in front of the entrance to the house, and smaller ones inside the house. 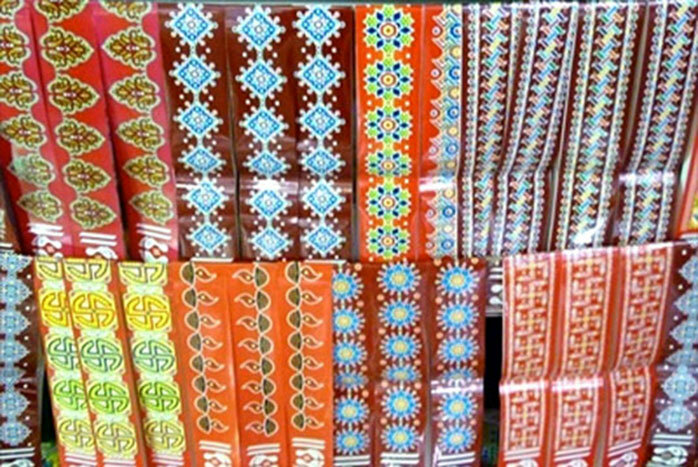 These are then outlined in red with 'kavi' a red brick paste, to make it look grander and more beautiful. Yet another symbol of prosperity is the colour yellow. Turmeric which is yellow or ochre in colour is also often used to fill in the white outlines. Sometimes, vermilion or kumkum is also used. Vermilion, is considered auspicious. Initially, colours were traditionally derived from natural dyes - from barks of trees, leaves, indigo, etc. However, today, synthetic dyes are used in a range of bright colours. When coloured powder such as rice, chilli, turmeric, etc. 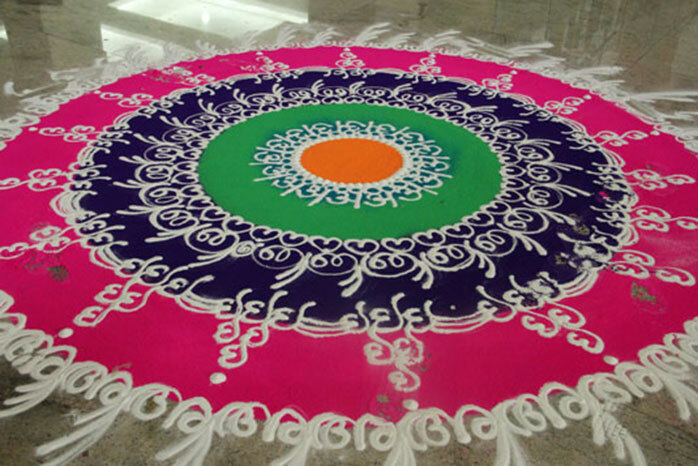 are used to enhance the white powder creations the rangoli takes on a flat 2-D like appearance. 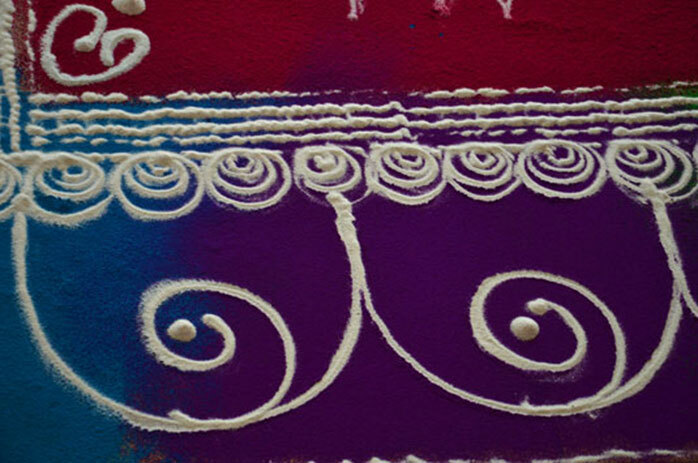 Whereas a 3-D effect in rangolis is achieved when cereals, pulses either in their natural colouring or tinted with natural dyes are used to decorate and elevate the look. Some artists use the 3-D effect for borders alone while others create beautiful designs using grains and beads entirely. Grains, pulses, beads, or flowers are also used to achieve the desired effects. 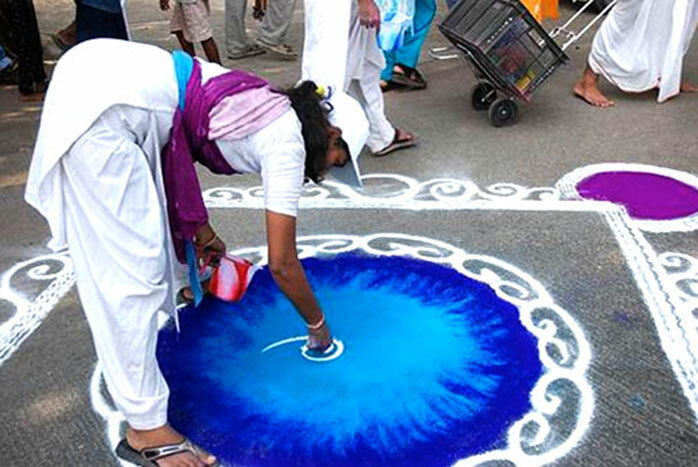 Coloured powders like indigo used for cloth staining, spices like turmeric, rawa, rice flour, flour of wheat etc are traditionally used in the rangoli patterns. 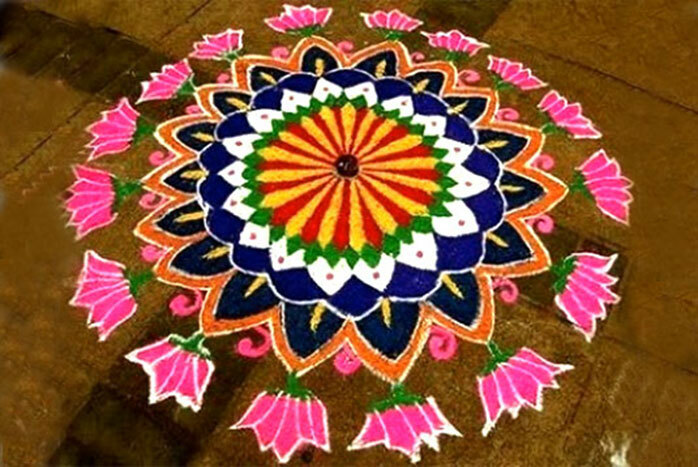 Coloured powders like indigo used for cloth staining, spices like turmeric, chili, rawa, rice flour, flour of wheat etc are traditionally used in the rangoli patterns. But in the present day, coloured powder is usually used directly for fancy decorations, but for detailed work, generally the material is a coarse grained powder base into which colours are mixed. The base is chosen to be coarse so that it can be gripped well and sprinkled with good control. The base can be sand, marble dust, saw dust, brick dust or other materials. 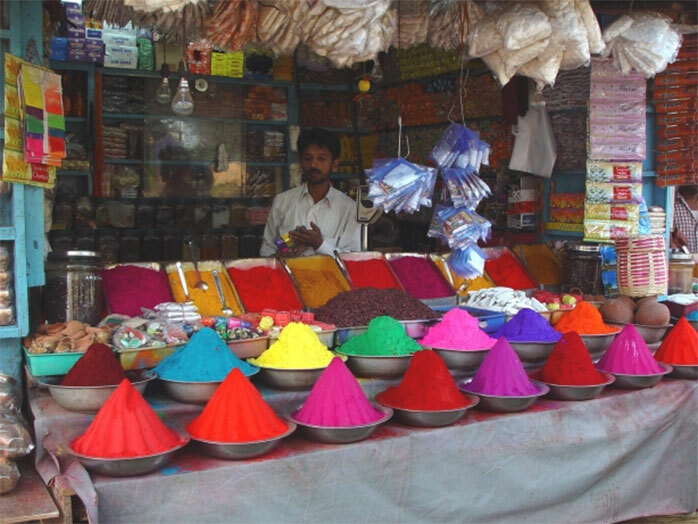 The colours generally are very fine pigment powders like gulal/aabir available for the Holi festival or colours (mentioned above) specially sold for rangoli in South India. Powder colours can be simply mixed into the base. If the base is light like saw dust, it can be used to make floating rangolis on the surface of still water. 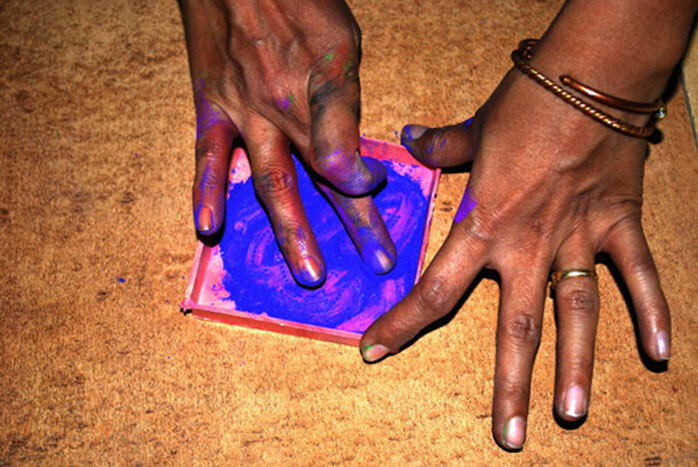 Sometimes saw-dust or sand is soaked into water based colours and dried to give various tints. 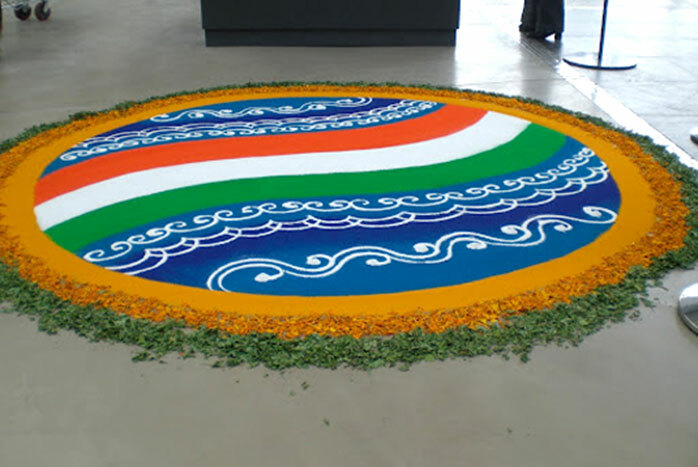 If a rangoli is to be made on water, the colour should preferably be insoluble in water. 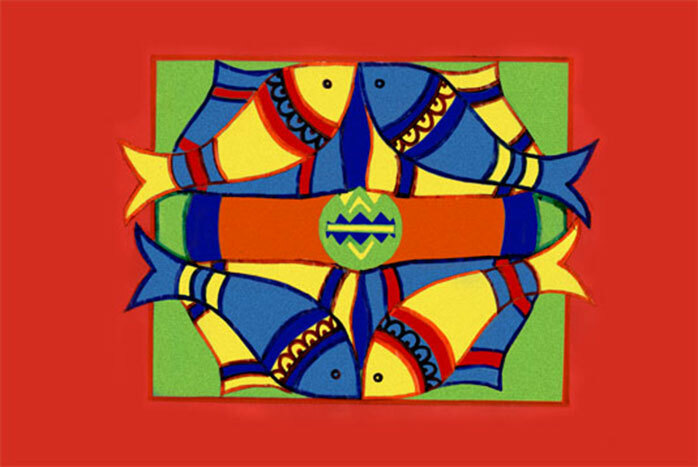 A large variety of materials are used to make the rangoli designs in the present day. People across the country have learnt to experiment and mix and match materials as the creative minds that make these rangolis are looking for innovative and modern answers. 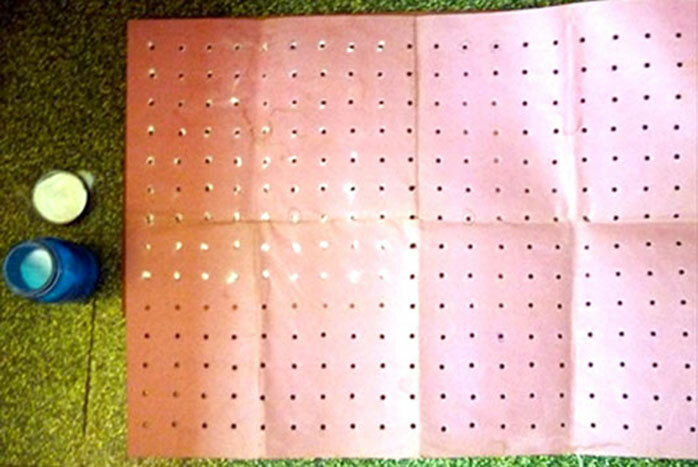 These materials are also coloured as per the need. A rangoli using these modern materials was created by students of IDC for the inaugural ceremony of TYPOGRAPHY DAY at IITB. This is a perfect example of the combination of learned rangoli skills, usage of modern materials and innovation and adaptation of the design to suit the occasion. The following pictures indicate the same. 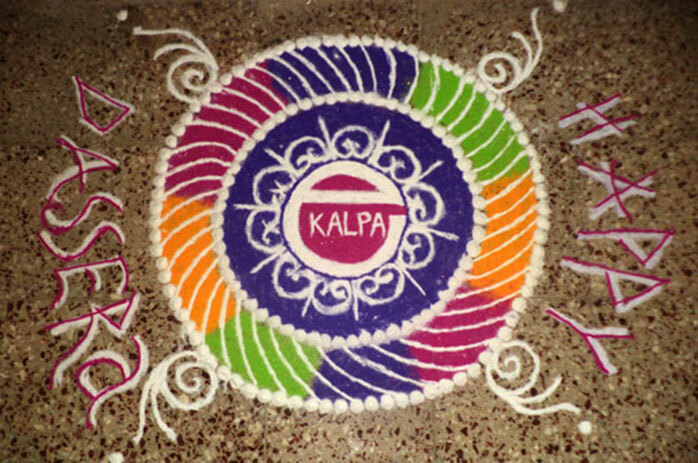 One can observe from this rangoli the usage of certain alphabets from some of the Indian languages as repetitive design elements. 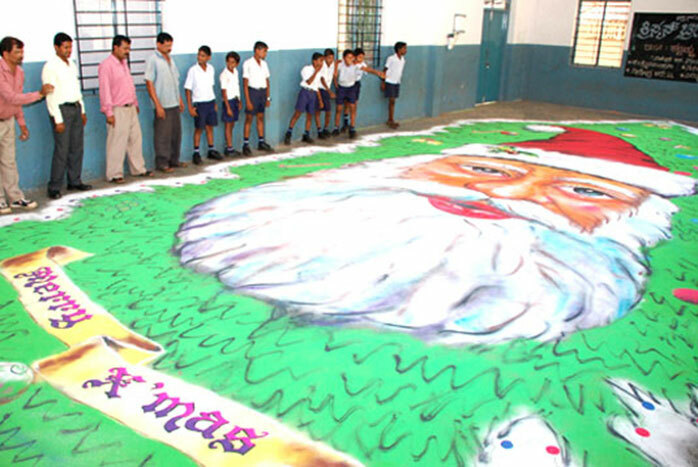 A link to the video of the making of this rangoli is also given. The video captures not only the skilled rendering but also showcases the dexterity of the person creating it. This kind of an excellence comes only with long practise and a sense of scale, proportion and a keen sense of colour sensitivity. 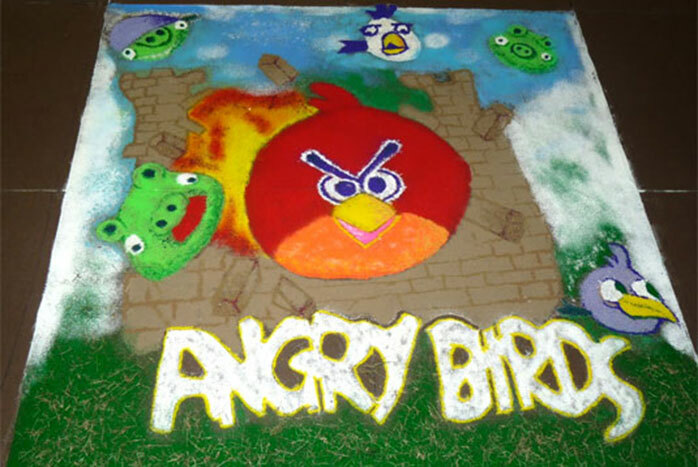 Most ardent rangoli creators possess these skill sets. 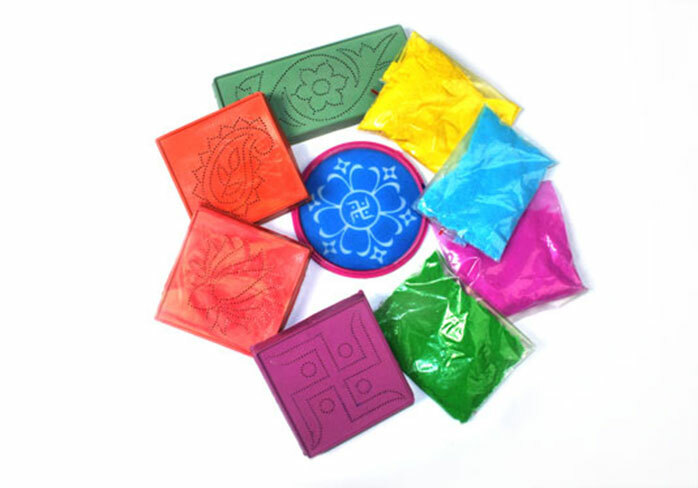 • Rangoli colours: These are readily available in the market. • Marble dust: This gives a good result, but becomes very heavy to carry in bulk. • Saw dust: Sawdust is easier to handle and spread. It even floats on water. • Rice: This is used as it is or ground for fine texture. Grains of rice can be used by themselves or they can be coloured using food colours. • Coloured Suzi/rawa: These grains are harder than saw dust and easy to spread, but they do not mix too well with colours. • Petals: Rose petals, marigold petals, small purple flowers, finely cut grass, leaves like methi leaves etc can be used to fill up large designs. Strings of marigold, strings of kanakambara(orange coloured slim delicate flowers available in South India), jasmine etc also are used to outline the rangolis. 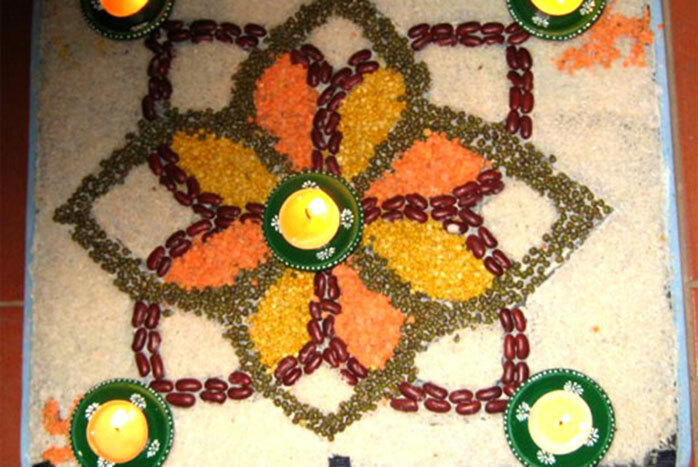 • Pulses: Different shaped and coloured pulses are used to fill up large rangoli designs. They lend a texture to the patterns. • Fabric or poster colour mixed with chalk powder: Small quantity of colour is mixed with chalk powder and applied with a brush on the floor. 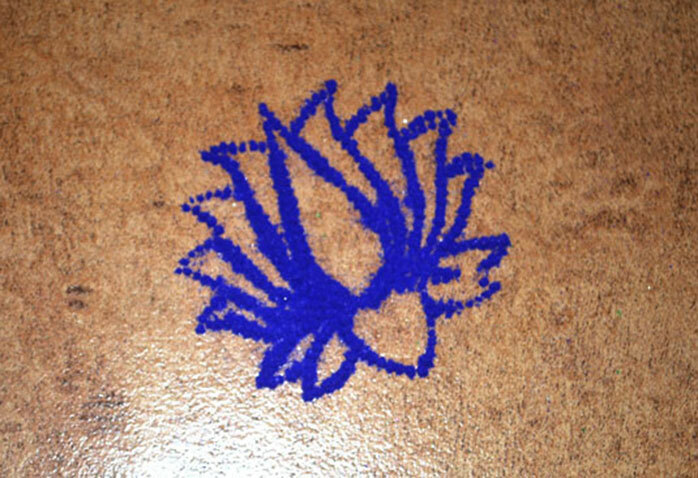 This looks like a painting on the floor ….not a traditional form of rangoli, but it has an advantage over the traditional format as it is very easy to create and lasts relatively longer. 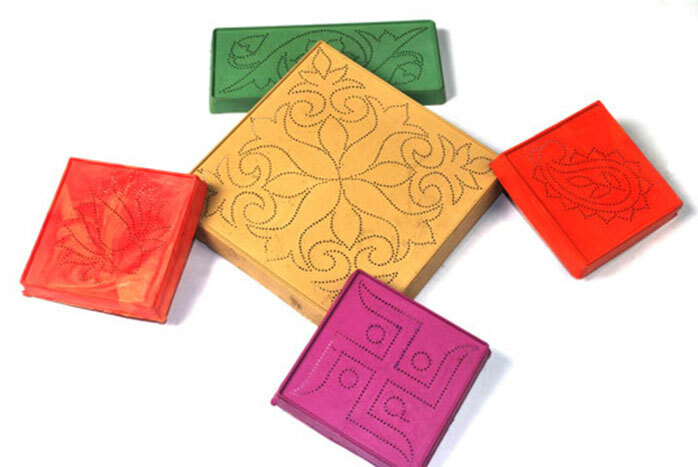 • Coloured stones: These are used only for big and abstract rangolis as finesse is not possible with such materials. Also, they are neatly arranged in the patterns rather than spread by hand. Rangoli also has a religious significance, enhancing the beauty of the surroundings and spreading joy and happiness all around. In Indian cultures, all guests and visitors occupy a very special place, and a rangoli is an expression of this warm hospitality. 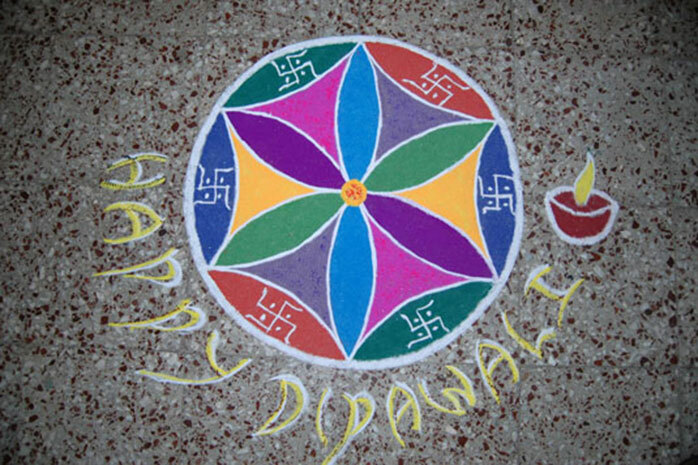 In particular, the Diwali festival is widely celebrated with rangoli, since at this time people visit each other's homes to exchange greetings and sweets. 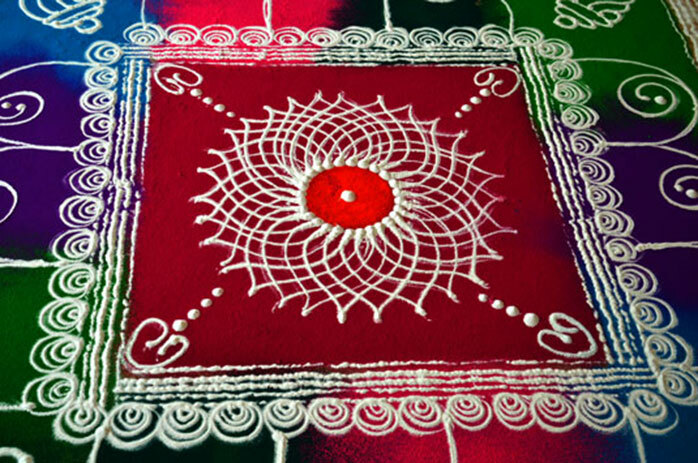 Festivals like the Onam and Diwali are Indian religious events where the Rangoli designs are used profusely. 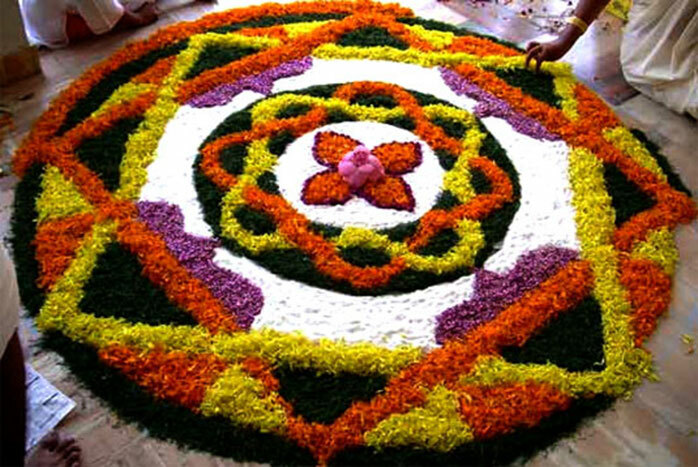 In the south Indian state of Kerala, flowers like marigolds and chrysanthemums and leaves are used to create Rangoli-the floor art is also known as pookolam. 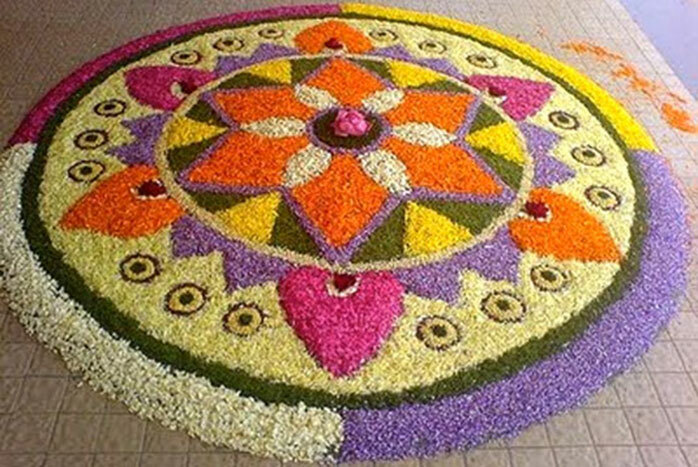 This is specially done on Onam Day (the most important festival in Kerala) or during the whole Onam Week, when designs are changed every day. 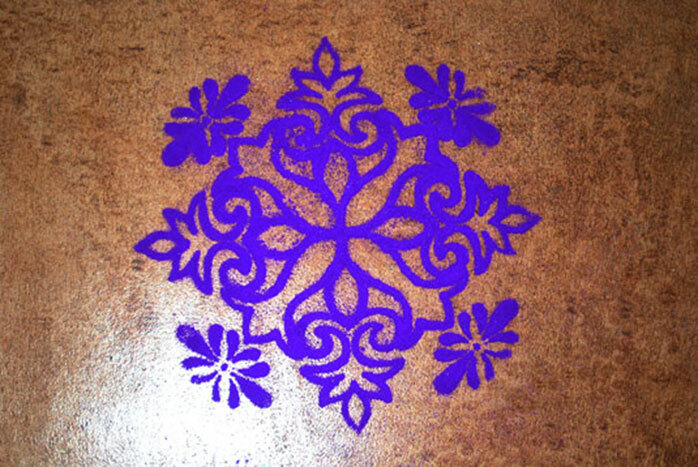 These rangoli designs may be created directly on to washed, wet floors or on a layer of wet mud. The designs start in a small way but as the days go by, more and more rangoli artists join and the designs get bigger and more beautiful. Not all flowers are suitable as some may fade and dry very quickly. For example, the bougainvillea which comes in beautiful shades of red, pink and white cannot be used because they wither very soon. Petals of various flowers, such as oleanders, cosmos, zinnia, chrysanthemums, daisies, roses, jasmine, and green leaves are arranged into lines and filled shapes. Sometimes the petals of large flowers, such as dahlias, are separated from the flower and these are used to fill the designs. Whole flowers may be used as borders to outline a design. Again, it is entirely up to the artist to use his or her imagination. Flowers being products of nature and being beautiful add a wonderful dimension of their own to the floor art. The combination of colours and flowers reflect the creativity of the artist. The THUMBA flower is a special flower that is small and light coloured and in the shape of a heel and sole of a foot, nicknamed, the VISHNU foot; it is necessary to use this in all flower kolams during ONAM. These pookolams being offerings to God are never cleared away with a broom when they need to be removed and are cleared only by hand. Diwali is the most lavish Hindu festival, occurring in October or November at the close of the rainy season, observed to propitiate the Lakshmi, goddess of plenty, luck and prosperity. 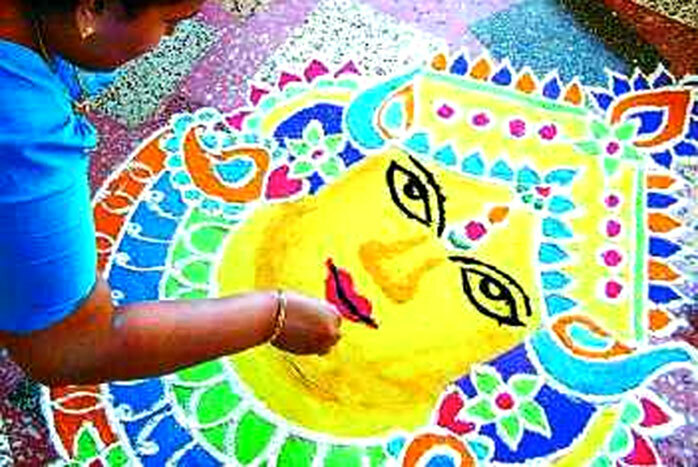 Women create rangoli patterns that invoke Lakshmi to manifest in their domestic space, securing her blessings and abundance in all walks of life. 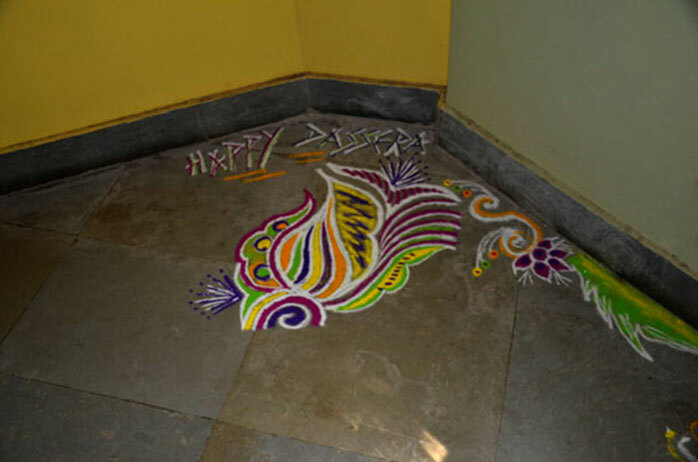 During Diwali, women create rangoli in every corner of the dwelling space, with multiple auspicious designs. Hexagons and six pointed stars, and six petaled lotuses are particularly used for Diwali to honour Goddess Lakshmi. Lakshmi footprints in a rangoli for Lakshmi puja during Diwali. During Diwali, Goddess Lakshmi is believed to visit homes that are well decorated and well lit, so families decorate their homes. People wear their best clothes or buy new ones, children are given presents and New Year greetings are exchanged through visits or Diwali cards. Adorning the entrances of individual homes with Diwali rangolis to welcome everyone is a common practice during this festival. Since the entire objective of making rangoli in Diwali is to welcome Goddess Laxmi small footprints coming into the home, representing the footprints of the Goddess, are made at the main entrance of the home or near the place of worship, which indicates the entry of prosperity into the home. It is considered very auspicious as it signifies showering of good luck and prosperity on the family residing in such a well decorated home. During Diwali some of the rangoli designs that are made are circular exuding a sense of endlessness of time. 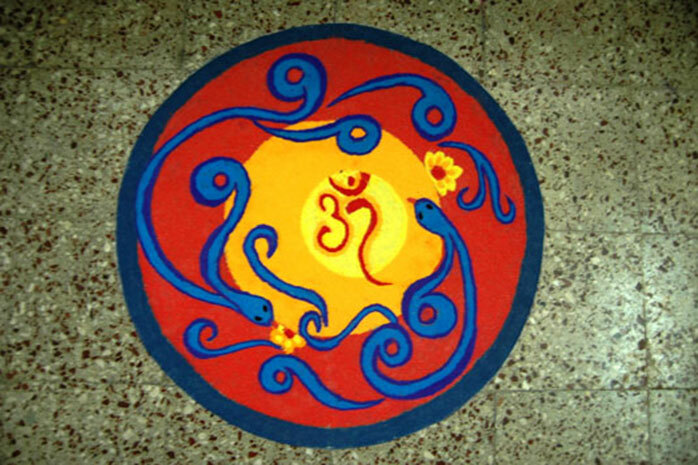 A central rangoli design is the symbolic one denoting the deity or the theme. Motifs that are generally used are lotus, fish, birds, snakes etc. which reflect the unity of man and beast. 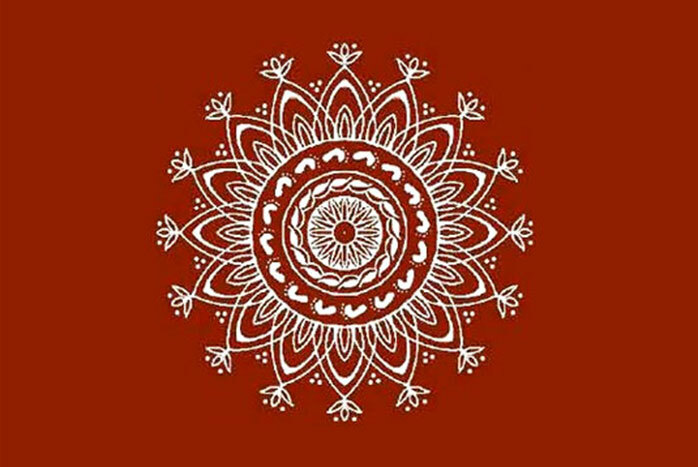 Layered with symbolism, Goddess Lakshmi in the lotus is represented in the rangolis, which indicates renewed life or the unfolding of life. Sometimes an elaborate rangoli usually has the look of a painting. Also during this festival, two interfaced triangles are created that indicates the deity of learning, Sarswati. Encircling this is a 24-petal lotus flower border, the outer circle being decorated with Lakshmi's footprints repeated in four corners. Sometimes the lotus petals are made in a triangular shape for variety. 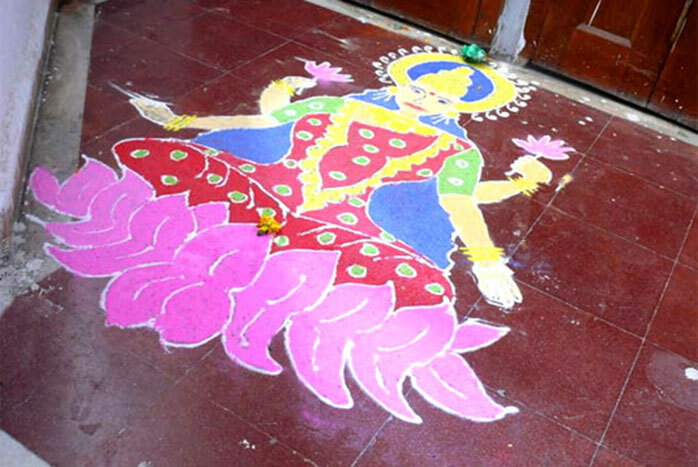 In north Bihar, Lakshmi's feet are drawn at the door, the toes pointing inwards to indicate her entrance. 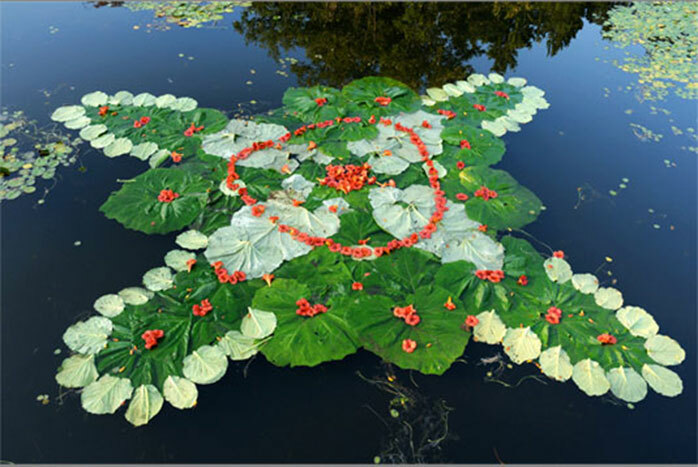 In Andhra Pradesh during Diwali an eight-petal lotus (ashtadal kamal) and many geometric patterns forming the lotus are created. In Tamil Nadu the hridaya kamalam an eight-pointed star meaning lotus of the heart is drawn. In Maharasthra too, the lotus is a basic motif during Diwali and designs like shankh kamal - shell lotus and thabak (which means salver) is in the shape of an eight-petal lotus with straight lines elaborated with curving lines to give it the appearance of a salver. In Gujarat there are said to be 1001 variations of the lotus which are drawn during Diwali, the festival when Goddess Lakshmi is worshiped. The Diwali festival is marked by gaiety and prosperity all over the southern part of India. 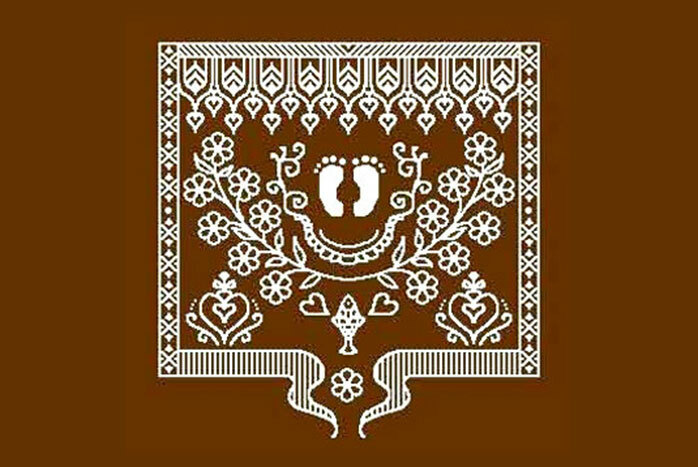 The rangolis drawn are basically geometric patterns formed with dots and lines to make squares, circles, swastikas, lotus, trident, fish, conch shell, footprints, creepers, trees and bear testimony both to individual genius and community participation as, many women work for days together on creating a single design. 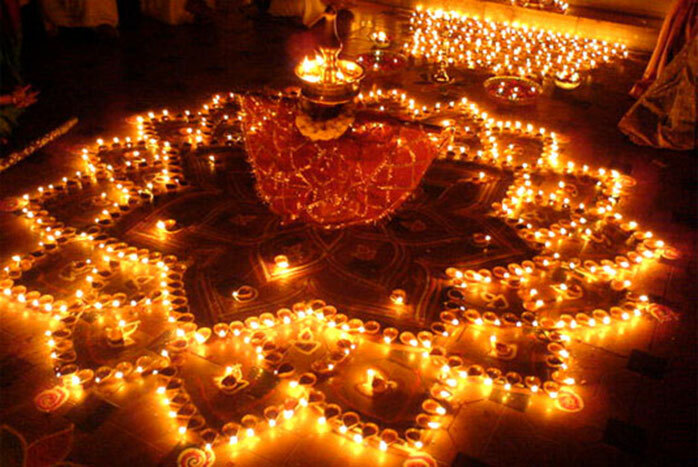 Oil lamps or diyas are lit in these rangolis towards the evenings, creating a festive atmosphere. The rangoli provides an object for “fascination” or attention in a sacred space, in an atmosphere filled with festivity and devotion and the eye follows the orderly pattern of the rangoli with directed attention. A rangoli is filled with culturally recognizable symbols for comfort, protection, and wish fulfilment, and is a visual encounter with an aesthetically pleasing, moderately complex pattern. But now with changing housing construction and social structures in India these are affecting the presence and requirement of rangoli. People are moving to urban apartment blocks where there is no area that can be set apart for pooja. 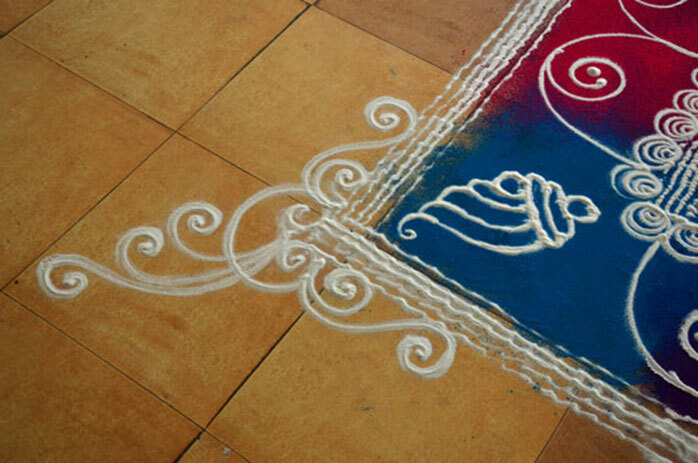 Floor surfaces, such as tiled, carpeted and linoleum are poorly suited for the creation of rangolis. Also many families have emigrated to other countries where the practice of this floor art becomes almost non-existent. But all this has not deterred the rangoli enthusiasts. They practice them on paper, on the computer, or conduct competitions, or network to form clubs so as to find avenues to conserve this creative art. In India, over the years different cultures have merged into its soul so the rangoli design is now seen more as a creative form of decoration during festivals and events than only a religious element. These influences are sometimes seen at Christmas time with elements like bells, reindeer, Santa Claus and different Holly wreaths used as a repetitive design element woven into geometrical rangoli designs. Further, artists hold exhibitions on Rangoli and other floor art where various modifications of the traditional art can be seen. Thus, in one variation, artists use even water as their medium! For this, a tank or tub of water is taken and kept in an area where the water will not be disturbed by breeze or movement of air. 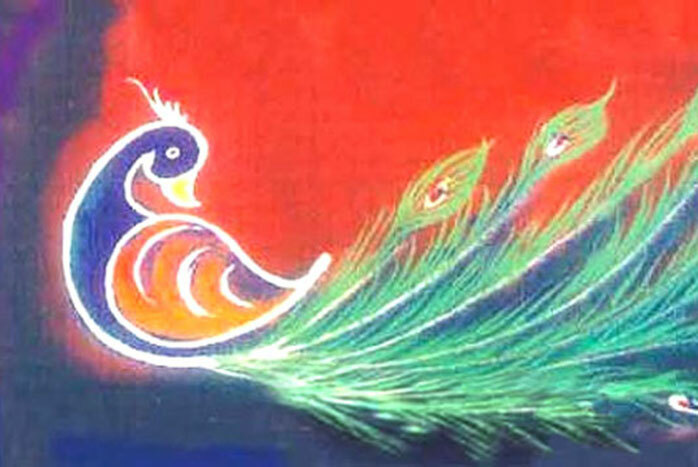 A fine layer of charcoal powder (which is light and floats on the surface) is sprinkled on the surface and the artist creates his/her designs using the rangoli powders on this water panel. The effect is magnificent, to say the least. Not all rangoli enthusiasts or practitioners are born artists. So to help them draw geometric designs, guides such as dots are placed strategically in the required shape of the design and then the artist connects these dots or goes around them in curves, lines and circles to create the design. In the present day market, there are several gadgets and design books to help the novice achieve near perfect rangolis - there are rollers - hollow tin rollers with handles and designs drilled on the surface, to be filled with rice powder and dragged effortlessly along the floor or across steps in diagonal lines to produce intricately designed rangolis. 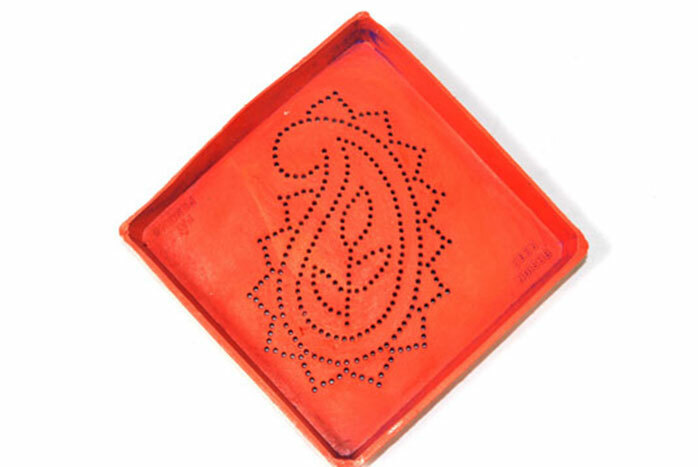 There are also plastic and metal trays, stencils or templates, sieve like trays with different rangoli designs on them to create instant rangolis; these have tiny holes along the pattern outline, so that when the rangoli powder is spread over the pattern, only the rangoli pattern gets transferred on to the floor instantly and neatly. There are also the kolam/rangoli stickers which can be stuck on the floor, in front of the altar or on the front doorstep. When these rangoli templates with various designs are used in combination with the rangoli rollers, new rangoli designs get created. 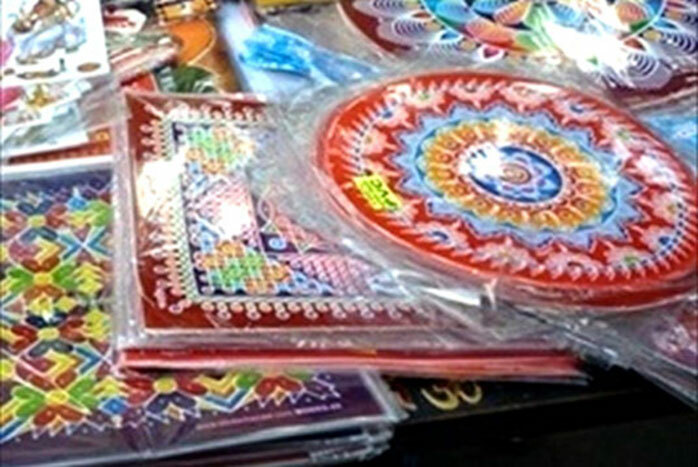 There are also plastic and metal trays, stencils or templates, sieve like trays with different rangoli designs on them to create instant rangolis; these have tiny holes along the pattern outline, so that when the rangoli powder is spread over the pattern, only the rangoli pattern gets transferred on to the floor instantly and neatly. 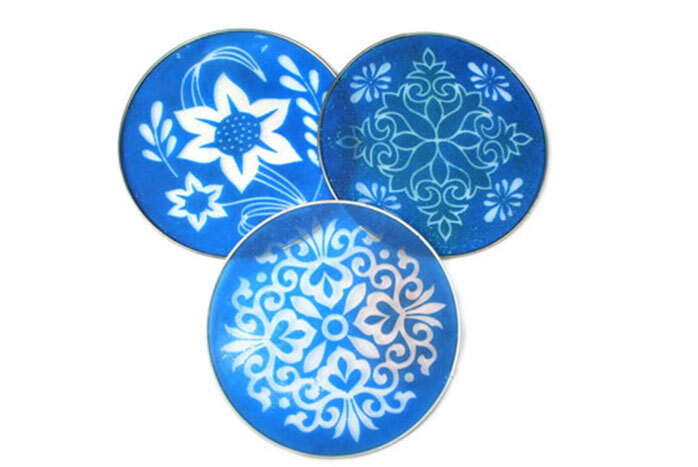 The plastic stencil trays come in different sizes; small ones with a single simple pattern, or a border pattern and large ones with a bigger complex pattern. The plastic stencil tray is placed on the floor. 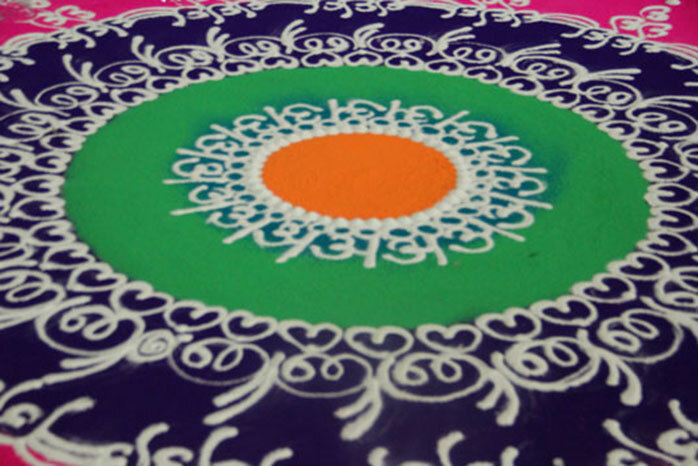 The coloured rangoli powder is put into the stencil tray, and then spread with the fingers over the pattern with holes, while holding down the tray firmly. 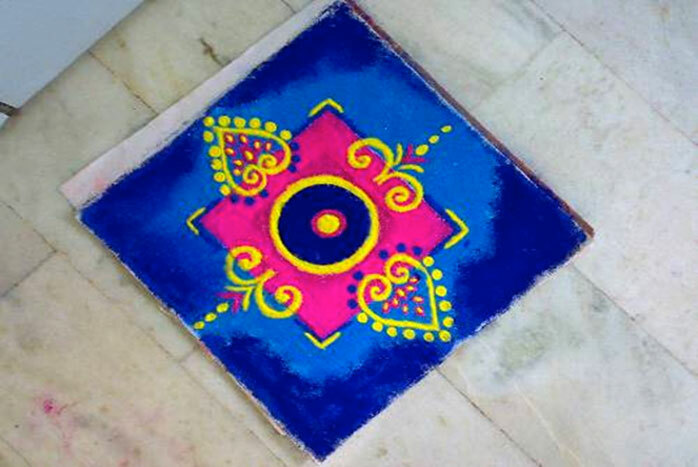 Then the tray is gently lifted up taking care not to smudge, leaving the dotted rangoli pattern on the floor. Circular pattern sieves come in small and large sizes with simple patterns and complex designs. 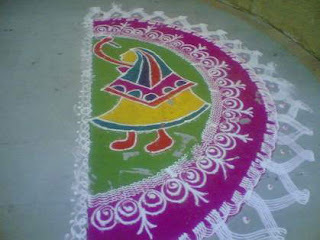 Similar to the plastic stencil tray, the plastic sieve is placed on the floor and the coloured rangoli powder is sprayed over it and gently dabbed down with the fingers. The sieve is then carefully lifted up without smudging, leaving behind the rangoli pattern on the floor. 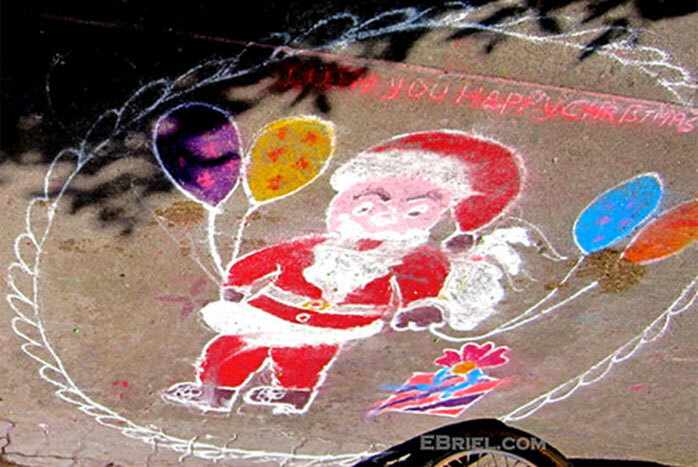 In this way a fast and instant rangoli gets created even by a novice rangoli maker. These rangoli templates with various designs when used in combination with the rangoli rollers, and with some creative planning new rangoli designs get created!